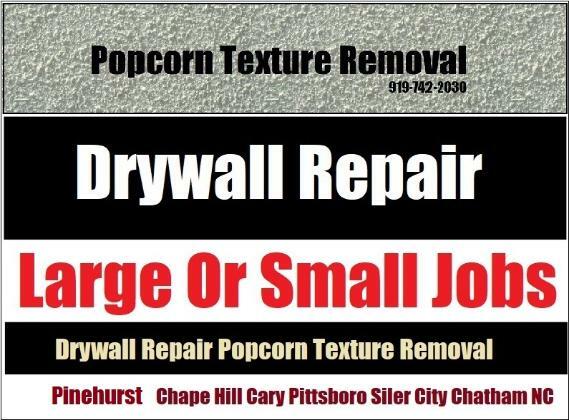 Drywall Specialist - Wall, ceiling repair and popcorn texture removal work in Pittsboro and surrounding areas. A skilled and highly trained expert that has provided local service for over 27 years. Affordable prices and free Estimates On Large Or Small Jobs. Nail pop, small holes, poorly finished joints, loose cracking joint tape and metal corner bead, holes, stress and settlement cracks, wet and water stained or damaged walls or ceilings can look like new. Drywall Specialist: Copyright 2017 All Rights Reserved 919-742-2030 - Pittsboro North Carolina Wall Ceiling Repair Texture Work. Based In Siler City And Servicing The Entire Pittsboro Area!, NC.